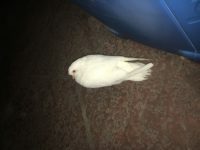 Found a dove in my backyard near SW 152nd St. I do not know if the bird is microchipped but it does have a band and a small wire on its other foot. Does not look injured. Please send me a message if this bird sounds familiar to you!